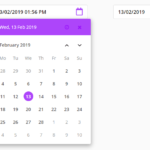 Rome.js is a simple to use JS library for appending a highly customizable date & time picker on your input field when clicked/focused on. Load the required rome.js at the bottom of your web page. 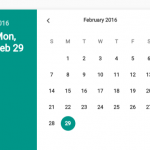 Load the rome.css into the head section of your page to style the date & time picker. 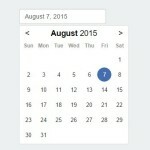 Create a regular text field that allows you to pick a date & time from a popup panel. 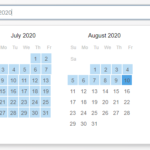 dateValidator: Function to validate that a given date is considered valid. 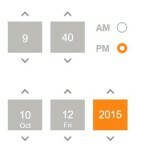 Takes a native Date parameter. required: Is the field required or do you allow empty values? 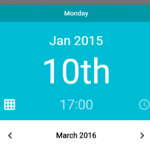 timeValidator: Function to validate that a given time is considered valid. 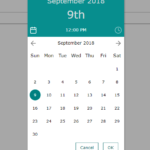 Takes a native Date parameter. 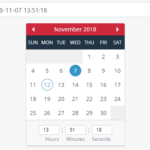 weekdayFormat: Format used to display weekdays. Takes min (Mo), short (Mon), long (Monday), or an array with seven strings of your choosing.